ET Car Repair is Responsive Joomla! template that targets for car repair shops or automotive repair website. 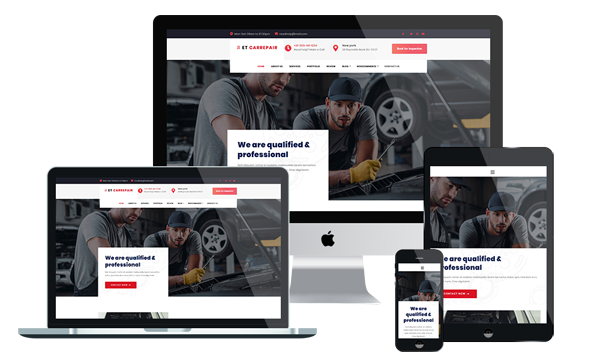 Car Repair Joomla Template manages to put a highly technical business in a professional, clean and attractive format that will definitely bring you more clients to the shop. It is important to create a great online presence to let people know they can trust you with their cars. This template is perfectly designed on powerful framework based on Bootstrap CSS grid layout, Page Builder for layout, Shortcode for editing information quickly. It is now even much better by supporting Font Awesome, Compress files, 4 color schemes and more. Car Repair Joomla Template is completely responsive and it supports cross-browser compatibility allowing the user to access your site from any device or platform. The smooth animation effects are created using HTML and JS which is the perfect way to make sure your design will work smoothly regardless of the device. There is no need to wait to create your web presence and make your mark – you just step away from a great website that is sure to impress!